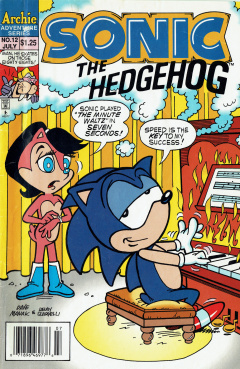 Sonic the Hedgehog 12 is the twelfth issue of the Sonic the Hedgehog comic series. It was released in July 1994. This comic features three stories: A Timely Arrival, The Bold-Headed Eagle, and The Lynx is a Jinx. Sonic is taking care of Robotnik's robots with ease, returning the broken parts of them to Robotnik in a wheelbarrow. Finished with the job, Sonic runs off to return home, leaving a mad Robotnik gripping two broken Badniks. His anger leads him to develop a new idea: a time machine. Sonic, meanwhile, returns to Knothole Village and meets up with Tails, asking where the rest of the Freedom Fighters are. Tails leads him to Sally's room, where she wants to show them something on her TV, though they enter as she sobs to a soap opera. She quickly tries to compose herself and nervously acknowledges Sonic, while switching the TV channel to Robotnik's news network. The Swatbot reporter introduces Robotnik's newest creation: a large mobile chainsaw. Robotnik demonstrates it on TV by starting to chop down the Great Forest. Sonic has seen enough, and enters into a spindash to leave the village to take care of the chainsaw. The tearing down of the Great Forest has made Sonic so mad that he launches himself through the roof and to the surface. He arrives at the chainsaw and Robotnik just as he finishes up another tree. Robotnik, however, can't hear Sonic's complaining, and asks him to come closer. He does so, only to reveal that the chainsaw was a lure, and activates a time teleporter that engulfs Sonic. The teleporter propels Sonic through an adventure to the past, all the way to the prehistoric age. Sonic lands on the ground, giving him a headache, only to be picked up by a Pterodactyl who wants Sonic for dinner. He enters into a spindash, causing the Pterodactyl to lose its grip and drops Sonic. As he drops, he looks down to see another dinosaur with an open mouth ready to eat Sonic as well. He drops into the mouth and enters a spindash again, destroying the dinosaur's teeth, then hopping out. While running along the ground away from the dinosaur, he's stopped by somebody else. He looks on as he sees his distant relative, Sonugh the Boghog, who looks like Sonic, but with a large white beard. Sonugh offers to show Sonic around, if he can catch up, so he starts running off. Sonic catches up with no problem. Watching from behind a rock, another being notices the two hogs, thinking he's seeing double. The being is Dr. Ivo Robughnik, the prehistoric predecessor of Robotnik. Despite the two hogs, he intends to take both down and prepares a rock catapult. He launches the boulder as Sonugh tells Sonic about Robughnik. Suddenly, the light goes down over the two as they look up, witnessing the boulder heading straight for them. It hits their area with a great thud. Robughnik comes out from his cover and starts dancing for joy, having defeated Sonugh and Sonic at the same time. At the same time, in the present, Robotnik dances as well, having finally gotten rid of Sonic. A Crabmeat in the same room tells Robotnik that he has broken his own rules. To ensure word doesn't go out about his own breaking of the rules, Robotnik destroys Crabmeat. He then goes over, with a Swatbot, to the new display he has set up for his time machine. The celebration is cut short as the Freedom Fighters storm the building, in memory of Sonic. Back in the past, Sonugh and Sonic are very much alive as Sonugh had burrowed the two underground prior to the boulder hitting. He tells Sonic that he has dug them to underground caverns that he lives in, and leads him to his home to cook up an egg. At the entrance, the prehistoric Freedom Fighters arrive by surprise. Not interested in rotten egg for dinner, Sonic asks the group if they want to go to the surface to get some food, sending the Freedom Fighters cowering in fear. Sonugh tells Sonic that they don't go to the surface and are even planning on burrowing farther underground. Sonic tries to convince them that they have to live on the surface, or else he'll turn into Sonic the Mole. Sonugh exclaims that it is to dangerous, with Robughnik and dinosaurs, but Sonic says that they'll adapt by hiding in the hedges. He takes prehistoric Sally by the hand and leads the group to the surface, showing them how to hide in hedges. The other Freedom Fighters then start playing and frolicking on the surface, making Sonugh realize they are happier there. Out of no where, Sonic is engulfed in energy again propelling him back into a time warp. He faceplants on the ground as he arrives in the present, looking up to see Knothole and the Freedom Fighters with Robotnik's time machine that they swiped in their raid. Back in the past, the Freedom Fighters are planting trees, even exhausting Sonugh despite his speed. Sonic is running along a cliffside so fast that he overshoots the cliff. As he falls, he tries to grab onto the side of the cliff, but can't get a grip. He crashes into a pile of foliage, looking up to see an old eagle asking who he is. Sonic tries to cool down the situation by saying who he is and that he was running from Robotnik's badniks. The eagle gets frustrated when he hears Robotnik's name, as he took all his friends and roboticized them. Only he was able to escape, which makes Sonic curious. He tells Sonic the story of how he escaped, by hiding in the mountains where he is right now and giving up on flying. He also introduces himself as Cyril, once a leader of his flock, now the last eagle on Mobius. In Robotnik's lair, Snively's radar display goes off as he detects a faint signal in the Mobian Mountains. Robotnik realizing there may be animals present asks for Snively to prepare his latest vehicle, the Rambot, for a drive to the mountains. Back at the mountains, Sonic tries to get Cyril back and active again, trying to convince him to fly like the eagle he is again. Despite claiming he's chicken at first, he gives it a shot and is able to fly off the side of cliff...initially. He falls, but is able to slow his land onto a twig on a cliffside below. Thinking he must give in to Robotnik, he hears his name, and looks over to see 5 members of his old flock who had been hiding from Robotnik for years in a cave. This gives Cyril a boost of confidence as he thanks Sonic to himself. At Cyril's nest, Sonic mopes, thinking that Cyril may have been caught by Robotnik because of him. He hears somebody and looks over to see Robotnik in a large vehicle shaped like a ram, wearing a Tyrolean hat. Snively looks over the edge of the vehicle, noticing it may be too large for the cliff. Robotnik ignores Snively and demands from Sonic the location of his friends on the mountain. Robotnik activates his vehicle's ram head, ramming Sonic off the cliffside (ignoring the cracking mountain from the vehicle's weight). Suddenly, Cyril, filled with renewed confidence, swoops down and saves Sonic from his fall. Robotnik notes the eagle to Snively, only to finally pay attention to his nephew, just as the cliffside breaks off from the mountain, sending the vehicle tumbling down with Robotnik and Snively. Cyril, with Sonic in tow, personally thanks him for his help, now with the rest of his flock following as well. Sonic has two animals in his grasp, a rabbit and a racoon, and is taking them away from two Swatbots who want to roboticize them. He returns to the other Freedom Fighters, who are also looking for animals to stop Robotnik's roboticizing raid. Sally, using her animal detector, detects an animal in a tree, but it won't come down despite the advancing Swatbots. Sonic runs up the tree and arrives at the animal, who introduces himself as Larry Lynx - Super Jinx, who brings misfortune to anybody he contacts. Sonic tries to convince him to come to Knothole, but suddenly, the tree branch they are on breaks, sending them plummeting to the ground and hitting the rest of the Freedom Fighters. They get up, but are all injured from the fall. Sally, thinking Larry is really a jinx, doesn't want to afford the risk of having him around and orders Sonic to hide him somewhere other than Knothole, walking away back home. Larry tries to convince Sonic to leave him, but Sonic refuses to listen to him. As they walk along a pathway, they walk under some apple trees which drop a whole pile of apples on top of Sonic. Despite this incident, Sonic continues walking along with Larry, in an attempt to figure out how to get him some good luck. They arrive in a rocky plain when Larry notices two Swatbots with the injured Freedom Fighters in shackles, ready to take them back to Robotropolis for roboticization. Larry is quite depressed due to the actions, but Sonic wants to use this bad luck to his advantage, so he tells Larry to go get the Swatbots' attention. He walks out, not blaming Sonic for giving up on him, attracting the attention of the Swatbots. They crowd around him and try to catch him, only to miss and smash into eachother. Another Swatbot nearby takes out a magnetizer to stun Larry. It fires, but the aim is off, rebounding off numerous rocks and hitting the Swatbot itself. Sonic runs out and grabs the magnetizer to free the others, just as Robotnik appears. Robotnik, in a large tractor, heads toward Sonic at full speed to run him over. Larry runs over to protect his new friend Sonic. Before he hits them, he loses control of the vehicle and crashes into a rock wall. Sonic frees the rest of the Freedom Fighters and proclaims that Larry's bad luck streak has ended, and intends to prove it. They take Larry back to Knothole, where he easily beats Rotor at fifty straight games of chess. This is the first issue edited by Scott Fulop. Prehistoric Sally wearing a bone in her hair is reminiscent of The Flintstones.